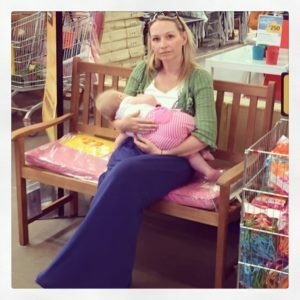 When my baby was a newborn we stayed at home a lot because I was shy about breastfeeding in public. Then we got the hang of it, and it was lovely being out and about together. But now he’s four months old and very easily distracted, so when we feed in public he often pulls off to look around, leaving me half dressed with milk spraying everywhere. What can I do? I don’t want to become a hermit again! Response: I used to do the two top, top up, top down technique to cover my belly. It means I can quickly whip down my top to cover myself when my little one does the ‘oh what’s that?’ game. Response: This stage didn’t last long for us, maybe a few weeks until our daughter got the idea that milk wasn’t available unless she was also available. I used to simply put myself away if she did this but I also used to keep a muslin over her arm underneath so I could easily pull it up quickly if she unlatched and I couldn’t cover myself easily. Response: I used to (and still do) wear necklaces that my daughter could play with while feeding. I found if she was fiddling with the necklace she wasn’t becoming so distracted as she had something to focus on. Response: I usually grab my daughter’s bib to catch the spray and as for exposing myself, I just don’t worry about it! Response: I hold my daughter close, and feed with that side closer to a wall if I can. I almost always have tops which pull up to feed, so the top half is covered by my top and the bottom half by my baby. Then she can take her time. I think people would really have to be close and staring to see much! Response: With my first baby I felt like this and I wouldn’t leave the house for months. Gradually I built up confidence, I started in the park and realised no one even noticed. Then I gradually went to places I felt comfortable. Eventually I found my way to a La Leche League meeting and I was away! I think it might make it worse if you feel nervous and it is better if a group of women go together: it kind of turns it into an LLL group meeting but out and about! Most people won’t even notice, and some might even expect it: in the years I have breastfed I have never had a negative comment. With my second baby I didn’t feel nervous and got on with it but I do remember feeling very anxious with my first. Slings helped too! 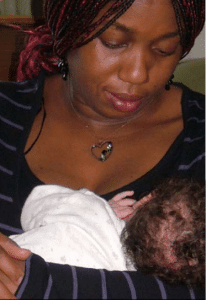 Response: You may well find that, like all the challenges of learning to breastfeed a newborn, this passes pretty quickly too. Most babies get more efficient in their feeding as they get older, and it often becomes important to them to get a feed finished so that they can carry on with what they were doing, when they’re out and about at least (the long, lingering, loving, sleepy breastfeeds at home may never stop, but then, who’d want them to? ).